Crayon Box Quilt Studio: Should I? 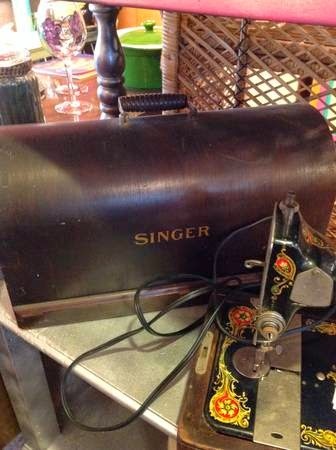 It is a Singer Red Eye with a Bentwood case. I used to never think I'd want one but I've found myself looking at the listings over the past year or so. The price is a steal from what I can tell. I certainly don't need it at all but it is pretty, isn't it? I'd definitely get it! When I couldn't pass up my garage sale vintage find...and brought it home...I immediately set it up by my quilt ladder and LOVE IT!!! 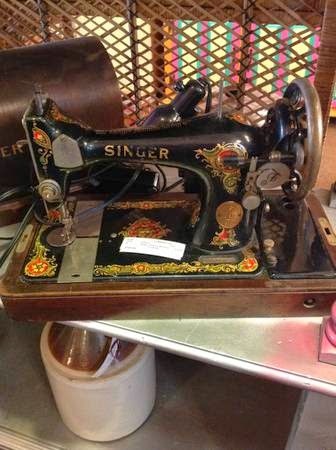 She is a beauty and if it works it would be fun for sewing. 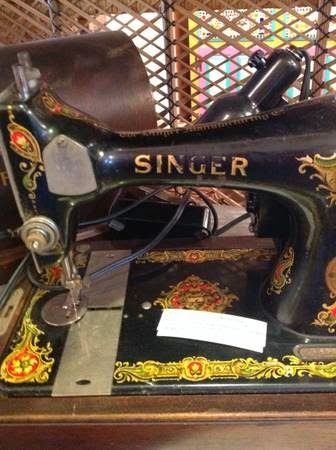 I am an antique machine hoarder so if the price is good and it looks in decent condition. Yep I would get it. Buy it!!! Even if it's not pretty, they are easily fixed up and it could be a collectors item worth three times what you pay for it in a matter of 5 years or so! I have almost 15 vintage machines....and I feel guilty all the time until I remember that some of them I will never find again and I own them!!! :-) Enjoy! Yes! 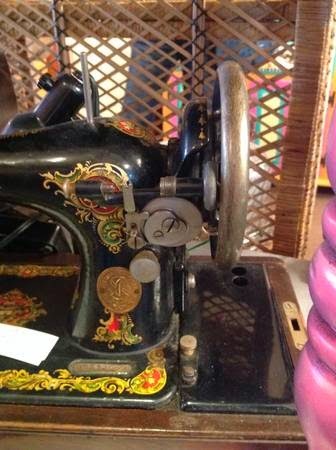 I have a machine very similar to this one - my daughter bought it for me at an adoption yard sale for $3 - they couldn't get the cover off, so she had no idea what condition it was in. But when we finally got the cover off, my word, what a beauty! I took it to the shop for a tuneup and they put a new cord on it, but other than that, it runs like a top!! It joined my mother's Featherweight and my vintage Singer treadle machine, and I've since bought a Singer 99K to keep it company. All lovely machines that run great! Watcha going to do with it? BUY IT!! Vintage sewing machines are awesome to use. You'd be preserving a piece of history by taking it home, oiling it up and using it. Just imagine all the history a machine like this has seen and it;s still going strong. She is certainly a beauty! If the price was right and she worked she would be coming home with me if I ran into her.